With many artists in my family, I thought I could try out to be an artist with a twist, I took help of technology to create a few pieces of art (I wonder if you can call it that). I thought I find out what kind of Art I could create from some of my photographs. Google uses an artificial intelligence program that looks for patterns, in order to sort and categorize images online. 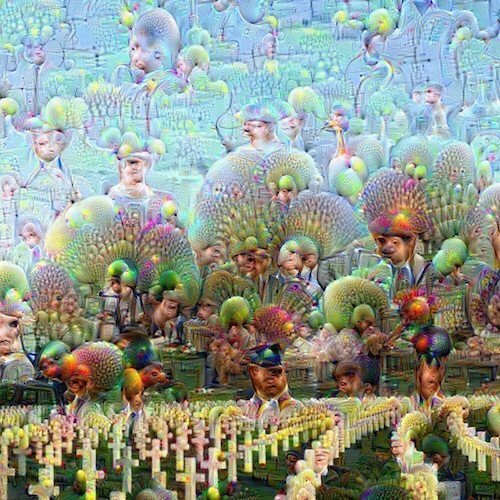 Google opened the source code up to developers under the name “DeepDream,” a few websites has sprung up that allows you to upload pictures and have them processed to output some dreamy pictures. I used Google’s Deep Dream – Online Generator to test it out. The first picture that I added are from two cyclists racing down a road. What do you think? Why do you not try yourself and produce your own psychedelic images with the Psychic VR Lab interface and Deep Neural Net Dreams. All you have to do is upload an image and wait for the code to transform into some kind of surrealist nightmare. Then post your creations to social media with the tag #deepdream. I created in total 4 dream images. It was easy to use the Deep Dream – Online Generator – just upload a file and let the generator do the job for you. My next image, I call Departing, as it was a picture taken from a cemetery and you can see how spirits are departing. Having more fun, I took a picture from a cycle path and gave it a go with the generator. I called this one The Path – it shows how you can follow your dreams and follow a path to the goals you set for yourself, at least my take on it. The Dream Generator is a platform where you can generate photos and images using a powerful AI algorithm called “Deep Dream”. Enjoy – if you have time on hand, you could try for yourself at Deep Dream – Online Generator. What I’m struggling with here is can you call it art, or is art anything that you want it to be. My final pictures is named pollutant showing cars on a draw bridge. I’m interested to hear your view on what art is.